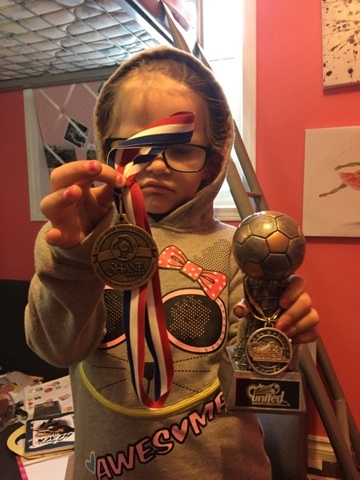 Penelope's indoor soccer season came to a close 2 weekend ago at MiniFest where they beat the other team 7-5 and she had 2 goals. 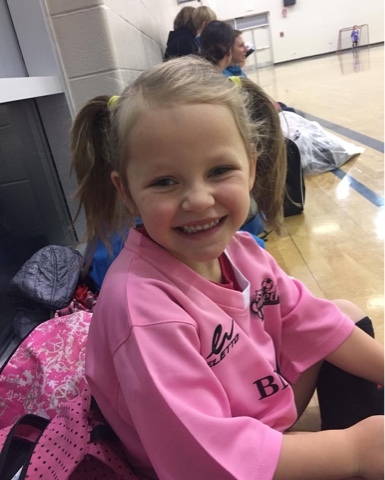 Penelope was so excited to have pink jerseys this year as both her and Finley have wanted them forever and she is running out of opportunities to do so because once she jumps a level she has to wear red and white which is SWU colours. Penelope played for the SWU U8 Developmental Girls team. She had practice on Wednesday nights at Cardel Rec South and Tech Training every Saturday morning at 1030 at Visions Sports Centre. She definitely learned a lot this season during her practices and especially at her tech training. She also spends most days in our basement practicing her drop kick even though she has zero intention of ever being a goalie and even if she did I would squash that dream so fast. I couldn't handle watching soccer balls come flying hard at her face. It's ok now, but in the older levels, shots are harder and it would stress me out wayyyyyy too much. Penelope had a great group of girls to play with this season. 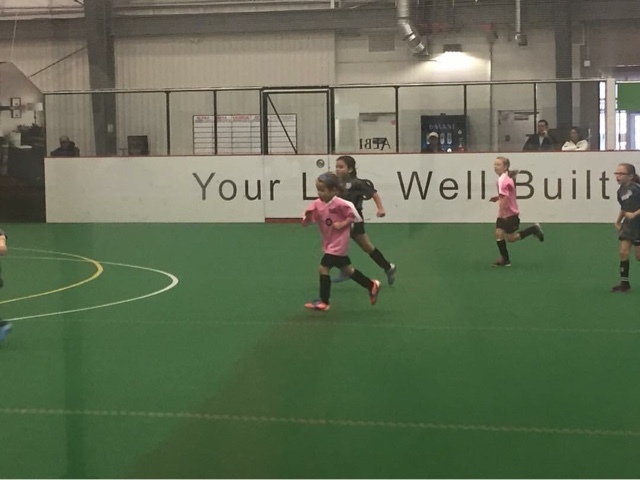 One instantly became her soccer bff and since both their sisters also play on the same team, they spend a lot of time together. We are hoping to keep this team intact for the outdoor season before all but 2 of the players move on to the next level up. Penelope is the youngest and smallest player on her team but definitely one of the best and that isn't just mom bias talking either. Actually, Penelope is the best player on the team when she wants to be and on more then one occasion, she decided she wasn't gonna play well and she didn't. She drives us both crazy when she does that. 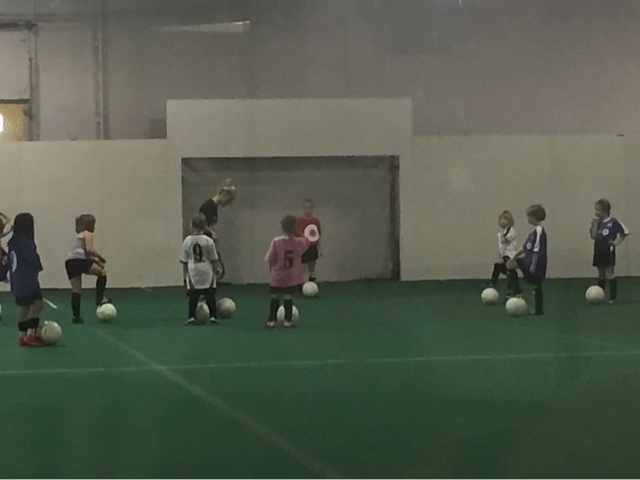 Despite her small size, she is very aggressive on the field and will do whatever she can to get or keep the ball and she doesn't care how big the opposing player on the other team is. On several occasions, she was probably too aggressive but they don't get fouls at this level so it is not too terrible haha. Her small but fierce stature has caught the eyes of other soccer clubs but at this time we have no interest in leaving SWU. I missed MiniFest because Finley had a birthday party to go to so I didn't see when they had their medals and trophies handed out so I made her do it one morning before school and she was less then impressed with doing it haha. She loves showing off her medals so not too sure why she wasn't cooperating then. We have a few weeks off before outdoor season starts for her. Luckily, they don't do evaluations at this level so her break is a bit longer then Finley's but she is very much looking forward to getting outside and kicking the ball around again. And my walls are too haha.